LOVE KILLER; Closed Minds = Closed Doors; how you're blocking your chances to find love and be more loved. AND what to do about it! Everywhere we turn these days, social media… friends… magazine articles… they are all talking about ‘becoming open to love’ or ‘you get what you put out into the universe’ as being a key element to attracting real, genuine, love into our lives. And hey, for a change, I am part of the almighty ‘they, who say all the things’ too, I talk about becoming open and how we can throw blocks up to love, with clients all the time. But what does being open really mean? How does one become open to love and therefore attract love? 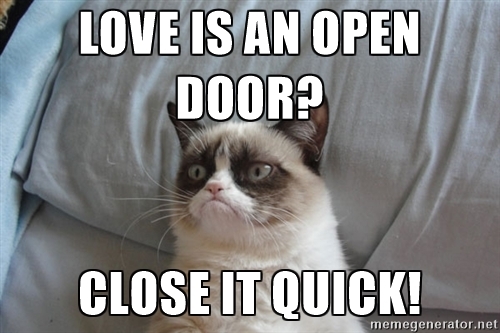 How are you slamming the door unconsciously on opportunities for love? AND, how do you stop? Coaching is all about the forward motion of the work. It’s less about where you have been and more about where you want to go, which is why coaching works so well. As I coach, I help you move forward; to define where you want to go and, step by step, how toget there. HOWEVER, just because it’s less about where you have been, does not mean our history isn’t worthy of inspection and not effecting our ability to move forward. It is crucial we take a look at what has happened to close you off in the first place. Chances are, you have some real evidence in your past that gives you genuine reasons to be a bit apprehensive and you started closing doors, one at a time, many years ago. Chances also are, that evidence has taken root and grown out of proportion, in your mind and heart, with every year that has passed. The greatest enemy to an open heart is a head filled with negative, fear mongering chatter. Think of it like this; Your heart, is one of the most resilient muscles in the body. It’s ability to heal is incredible. And that heart of yours, she has some scars from love but left to her own devices, she’s is a bit of a ‘short hair, don’t care’ wild child. Cause what she needs to survive is love. Your heart, is made for loving. Your brain, is all intellect, ration and memories. Your brain, doesn’t have the same natural ability to heal itself. If a nodule gets damaged, you lose functionality not just in the brain but wherever in your body that part of the brain is meant to control. Your brain, being a smarty pants, elected itself to the role of head bouncer at Club Heart a long time ago. It determines the flow of traffic, all too often holding up red stop signs to anyone or any thought who wants to enter. Clinical neurological studies have shown that this reactionary cognitive ability to self-protect starts as early as 2-5 years old. And, yes, your heart needs someone looking out for her (she cray cray sometimes) but not in a lock her up and throw away the key, kinda’ way! So how do we know if our mind is throwing up yellow slow down signs or full on stop signs? and when they should be heeded and when they are just getting in our way of finding, growing and keeping love? My clients and I, spend a couple of sessions (and sometimes way more) where we hold court, taking a hard look at what has happened to the heart and then we listen to the brain’s defense. And we listen really carefully to how the brain’s defense, its mode of self-talk has grown and changed since the incident in question to the present. We start to write them down, one by one. We DO NOT try to stop or re-write the head chatter in those first sessions, but simply spend a few weeks, listening and documenting the head chatter. You have some real zingy one liners rattling around in there. And you have been thinking and saying them for so long, you no longer hear it as a conscious thought. They have become the constant companions, by your side, offering whispered commentary and throwing up some serious STOP signs as you move through this life. As a coach, mostly my job is that of a mirror, and I often repeat back what a client has said to me in this process, and they reply quite surprised “I said that?? !” or they furiously scribble down one of these phrases on paper and then, read it back and are a bit shocked, because it’s such an embedded element of the background noise in your head, it has become more of a melody that’s hummed then words distinctly sung with effort. After a week or so of documenting the negative head chatter. I ask clients to not only take note of the negative head chatter, but to stop and write down what they were thinking and feeling before, and how that changed after the negative self-talk said, what it had to say. What happened to their body language? Their smile? Their shoulders? The canter of their footsteps? How likely did they feel to pursue the action or train of thought they were considering before the negative one liner showed up to the party? I always get hurt in the end. That’s not what men/woman want. I’ve been hurt before and I can’t go through that again. In the coaching world, we call these ‘Limiting Beliefs’ or ‘Negative Self-Talk’. And this is phase one of Limiting Beliefs. We are not yet into the level of self-esteem but more how we project general negativity (and past hurt) onto current situations and people, therefore limiting the engagement in relationships, conversations and actions before we really get started. It’s how we mentally throw up STOP SIGNS, to the possibilities. And although we may not realize we are doing that, IT SHOWS, big time. Our tone, our body language, our general outlook on life is tainted by these limiting beliefs and they present a closed door to all who try to enter and to ourselves from entering new experiences. And yes, you are SO worth someone kicking open doors to get to you doll, but open whole hearted people are attracted to other open whole hearted people. They want to fight with you for a great life, not fight against your inner minefield to just be a part of your life. They want to be judged on their own merits, their own successes and failures, not on other people’s mistakes. So its okay to say “I have been hurt before” however we need to tweak that so we leave the doors cracked open, if not still wide open. So instead of “I have been hurt before, and I can’t go through that again” we say reply, “ I have been hurt before. I not only survived it, learned from it ...I am stronger for it; And I can do so again, if need be”. Take the kick starter exercises outlined in this blog today, away with you. Spend a week in mindfulness listening out for the limiting beliefs, those sweeping generalizations and zingy one liners you find yourself thinking and saying. Write them down. Do not try to re-write them, for now. Just take notice if a handful take center stage, repeated throughout your life. You are always welcome and encouraged to message me directly for more guidance. HOW WE START TO CHALLENGE & REWRITE THESE LIMITING BELIEFS IS HELLA CRUCIAL TO GETTING MORE OPEN. Next week, we’ll chat some more about how to start re-writing them in a bespoke, believable way, so YOU can begin to open yourself up to the possibility of love! From limiting to limitless, babe! Newer PostHand over the ‘Limiting Belief’ security blanket, cause darlin’ its smothering you AND your chances for love, WITHOUT sounding like some platitude crazed wanna be guru! Older Post“Dating is taking a real toll on my confidence” - 3 tips to get a Confidence blast, starting NOW!